The Italian Futurists painted in a variety of different styles, ranging from Cubist-like compositions of angular facets to Pointillist-like compositions of brightly colored dots and dashes. The Futurists borrowed the surface appearance of these movements, but applied them to their own particular aim: to capture and convey what they thought of as the essence of modern life: dynamism -- fast-paced motion and energy. While almost every ‘modernist’ movement we have seen so far actually turned against ‘modernity’ (understood as the sweeping social, economic, technological, intellectual, and lifestyle changes that accompanied industrialization), the Futurists actively embraced those changes (as indeed the name of the movement suggests). How is this embrace of ‘the modern’ visible already in the subject matter of the works below? Read the two Futurist Manifestos (above) and be sure you understand the two main demands the Futurists made: destroy the old and establish a new aesthetic and a new society based on dynamism. Why does Marinetti exhort the burning of libraries, the flooding of museums and so on? (Why was this destruction of the old particularly important to -- and difficult for -- the Italians?) Why were the Futurists in favor of masculinity and war (how does this interest fit in with their interest in dynamism)? 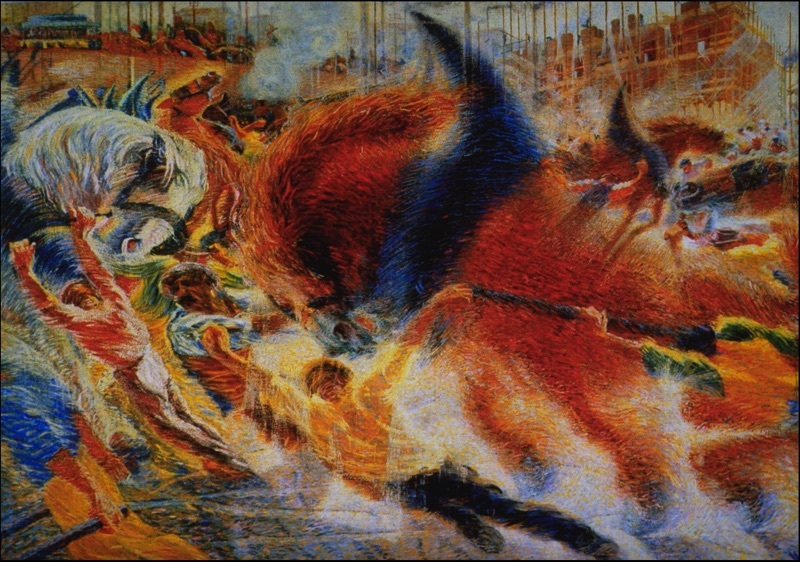 Be sure you understand the difference between depicting "a fixed moment in universal dynamism" and depicting "the dynamic sensation itself" (Futurist Painting: Technical Manifesto, 1910). What are some of the ways in which the paintings below attempt to convey motion in a still representation? What hints did the Futurists derive from contemporary photographers such as Muybridge and Marey? 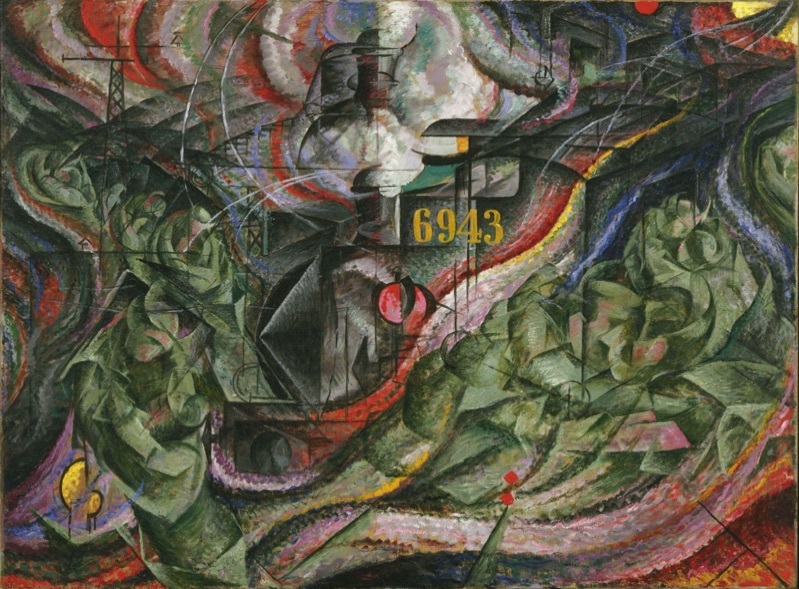 In addition to the literal understanding of dynamism as motion, the Futurists also attempted to depict energy in art. 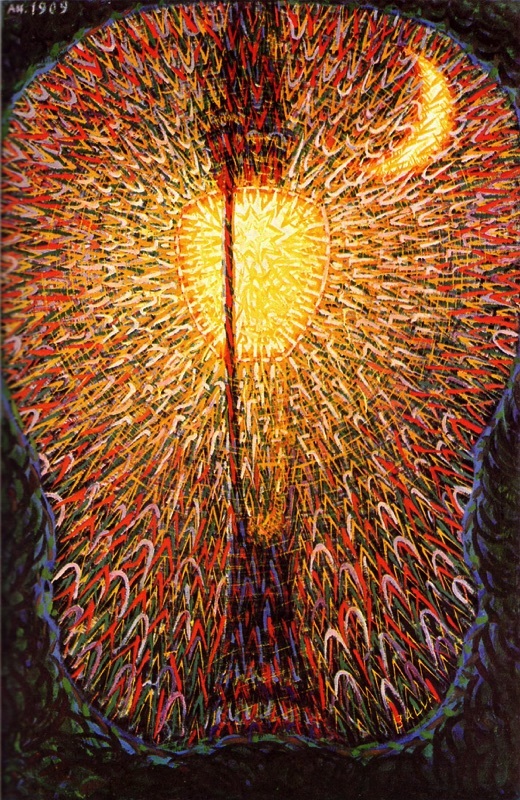 Think about that: energy is not really visible, so how can you depict it in visual art? The late-nineteenth and early-twentieth century saw the discovery of the multiple forms of energy that are invisible to the human eye (which only sees the small slice of energy waves called the visible spectrum): ultraviolet and infrared waves, radio waves, X-rays, gamma rays, etc ... Think about this project in relation to the wave-like forms in the States of Mind, below, and in relation to the Futurists’ frequent dissolution of the mass and solidity of bodies in colored light. Matter such as logs can be burned to release energy (light and heat) -- so the physical ‘stuff’ of the world can be seen not just as static, stable things, but as potential energy; and the way of depicting the release of that energy is by showing the dissolution of mass into color and light ... The Futurists probably didn’t know it, but Einstein’s contemporary (1905) equation E=mc2 describes precisely this ability of mass and energy to transform into one another. It's an exciting idea, and note that it is yet another way of thinking about color in painting (contrast Impressionism, Expressionism, Kandinsky, and so on).